Although I love Dobby the House Elf in the Harry Potter books, I’ve decided to give up dressing like him. I never meant to become an eyesore. Slovenliness snuck up on me. But, in my defense, it seems like a waste of valuable knitting time to put together a coordinated look in order to sit at home knitting. Still, one doesn’t want to let these things get out of hand, so I compromised by knitting a house sweater. I’m happy with how it turned out. It’s roomy, comfortable, and looks better than lots of things I wear. It was also fun to knit because I made up the design as I went. I started only with the intention of knitting a simple sweater with minimal shaping. I determined my gauge and my desired neck width and decided on everything else as things progressed. That’s the beauty of a top-down raglan. You can try it on and adjust things as you go. I didn’t want any pattern or embellishments on the sweater, but I did add visible decreases on the front and back. I like the rolled hem at the neck, but chose a bumpy garter stitch hem for the bottom and cuffs. On the raglan seams, I increased every other row for the first and last couple of inches, and every third row for the main section. That gave me a roomy but neat looking armhole. I’m calling this sweater a success even though it’s not gorgeous, and it’s made from yarn of questionable quality. That’s all OK, because the yarn and the design were perfect for my plan of a hanging-around-the-house-doing-dishes-and grooming-the-cat kind of sweater. 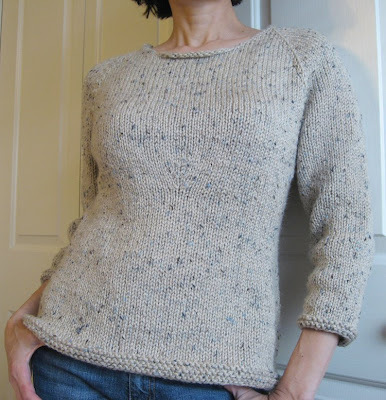 Pattern: My version of a basic top-down raglan. Finished chest is about 36". Yarn: A little less than 6 skeins (750 yards) of Patons Shetland Chunky Tweeds, in Beige. 25% wool, 75% acrylic. Mine has blue stripes and I already made a matching hat with a pomp-pom that turned out way too big. And I envision adding a pair of black "combat" booties and a camo hat. It's gonna be awesome.